Nathaniel Portlock (c. 1748 – 12 September 1817) was a British ship’s captain, maritime fur trader, and author. He entered the Royal Navy in 1772 as an able seaman, serving in HMS St Albans. In 1776 he joined HMS Discovery as master’s mate and served on the third Pacific voyage of James Cook. During the expedition, in August 1779, he was transferred to HMS Resolution. He passed his lieutenant's examination on 7 September 1780, then served on HMS Firebrand in the Channel fleet. On Cook's third voyage, furs obtained in present-day British Columbia and Alaska sold for good prices when the expedition called at Macao. In 1785 Richard Cadman Etches and partners, including Portlock and George Dixon formed a partnership, commonly called the King George's Sound Company, to develop the fur trade. Dixon had also served on Resolution in the Pacific Ocean under Cook. In September 1785 Portlock and Dixon sailed from England. Portlock was in command of the larger vessel, the 320-ton (bm) King George, with a crew of 59. Dixon's was in command of the 200-ton (bm) Queen Charlotte, with a crew of 33. Dixon and Portlock sailed together for most of their three-year voyage. They crossed the Atlantic Ocean, reaching the Falkland Islands in January 1786, and transited Cape Horn to enter the Pacific Ocean. They reached the Hawaiian islands on 24 May and anchored in Kealakekua Bay (where Cook had been killed in 1779), but did not go ashore. They took on fresh food at other Hawaiian islands and proceeded on to what is now Alaska. After two years of plying the waters, Portlock and Dixon departed North America, reaching Macao in November 1788. On their return Portlock and Dixon published an account of the voyage, based in part on letters written by William Beresford, the trader on the expedition. Returning to the Royal Navy in 1791, Portlock was appointed to command the brig HMS Assistant, which accompanied Bligh on his second voyage to transport breadfruit plants from Tahiti to the West Indies. Following his return to England in 1793, Portlock was promoted to commander and later commanded the sloop HMS Arrow. In 1799 he was promoted to captain, and served as a Sea Fencibles commander at Poole in 1803, and at Dartmouth from 1805 to 1807. He died on 12 September 1817 in Greenwich Hospital. His son, Major-General Joseph Ellison Portlock, was a British geologist and soldier. Portlock Harbor, a bay on the west coast of Alaska's Chichagof Island, was named by Portlock in 1789, following a visit there in August 1787. Portlock, a cannery settlement active in the early and middle 20th century, and Portlock Glacier, both on Alaska's Kenai Peninsula, were named in his honor. HMS Lutine — while commanding Arrow, Portlock was involved in the wreck and attempted salvage of Lutine, which sank on 9 October 1799 carrying a large cargo of gold. ^ Halpenny, Francess G, ed. (1983). "Portlock, Nathaniel". Dictionary of Canadian Biography. V (1801–1820) (online ed.). University of Toronto Press. ^ King, Robert J. "Spanish America in Eighteenth Century British Naval Strategy and the Visit of the Malaspina Expedition to New South Wales in 1793". Archived from the original on 28 October 2005. Retrieved 6 September 2009. ^ "Captain Nathaniel Portlock (c. 1747-1817)". National Maritime Museum, London. 2008. Retrieved 26 October 2015. ^ Orth, Donald J. (1967). Dictionary of Alaska Place Names. Washington: U.S. Government Printing Office. p. 773. Laughton, John Knox (1896). "Portlock, Nathaniel" . In Lee, Sidney (ed.). Dictionary of National Biography. 46. London: Smith, Elder & Co.
Pethick, Derek (1976). First Approaches to the Northwest Coast. Vancouver: J.J. Douglas. pp. 97–100. ISBN 0-88894-056-4. Portlock, Nathaniel (1789). A voyage round the world but more particularly to the north-west coast of America: performed in 1785, 1786, 1787, and 1788, in the King George and Queen Charlotte, Captains Portlock and Dixon. London: J. Stockdale and G. Goulding. OCLC 221899194. OL 6961184M. Dixon, George (1789). A voyage round the world but more particularly to the north-west coast of America: performed in 1785, 1786, 1787, and 1788, in the King George and Queen Charlotte, Captains Portlock and Dixon. London: G. Goulding. OCLC 243542399. OL 22121376M. Restarick, Henry B. (1928). 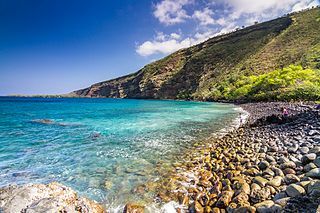 "Historic Kealakekua Bay". Papers of the Hawaiian Historical Society. Honolulu: The Bulletin Publishing Company. hdl:10524/964. John Ledyard was an American explorer and adventurer. John Meares was a navigator, explorer, and maritime fur trader, best known for his role in the Nootka Crisis, which brought Britain and Spain to the brink of war. George Dixon was an English sea captain, explorer, and maritime fur trader. George Dixon was "born in Leath Ward, a native of Kirkoswald". The son of Thomas Dixon, he was baptised in Kirkoswald on 8 July 1748. Kealakekua Bay is located on the Kona coast of the island of Hawaiʻi about 12 miles (19 km) south of Kailua-Kona. Settled over a thousand years ago, the surrounding area contains many archeological and historical sites such as religious temples (heiaus) and also includes the spot where the first documented European to reach the Hawaiian islands, Captain James Cook, was killed. It was listed in the National Register of Historic Places listings on the island of Hawaii in 1973 as the Kealakekua Bay Historical District. The bay is a marine life conservation district, a popular destination for kayaking, scuba diving, and snorkeling. Lady Penrhyn was built on the River Thames in 1786 as a slave ship. For her first voyage she transported convicts to New South Wales as part of the First Fleet. On her voyage back to Britain she was the first European vessel to pass by the Kermadec Islands, and the Penrhyn Atoll in the Cook Islands. She also carried a cargo for the British East India Company (EIC). The French captured her in the West Indies in 1811 and scuttled her. King George was a British merchant ship engaged in whaling and the maritime fur trade in the late 18th century. She was launched in 1785 and taken up by the King George's Sound Company. She sailed in 1785 on a voyage of exploration, together with the Queen Charlotte. The two vessels whaled in the South Seas and sought furs in the Pacific Northwest. They returned to England via Canton, where they picked up cargoes for the British East India Company (EIC). Their voyage accomplished a circumnavigation of the world. On her return new owners apparently sailed her between Britain and South Carolina. She is no longer listed after 1796. Johann Heinrich Zimmermann (1741-1805) sailed on HMS Discovery on James Cook's third voyage to the Pacific (1776-1780) and wrote an account of the voyage, Reise um die Welt mit Capitain Cook. In 1782 he was invited by William Bolts to join a voyage to the North West Coast of America sailing from Trieste under the Imperial Austrian flag. He subsequently commanded the Austrian East India Company ships Concordia and Edward on voyages to India. Kalaimanokahoʻowaha was an aliʻi high chief of the island of Hawai'i who lived during the period of Captain James Cook's visit and western naming of the Sandwich Islands. He was the chief said to have struck the first blow to Cook when he attempted to kidnap Kalaniʻōpuʻu, the king of the island. He was called Kanaʻina nui as a birthright from his father, Keaweʻopala, first born son of Alapainui. After his father was killed by Kalaniʻōpuʻu, he would serve the new king as a kaukau aliʻi, a service class of Hawaiian nobility that his mother, Moana Wahine had descended from. This aliʻi service line would continue throughout the Kingdom of Hawaii.